Not even shade was cool. I thought those outside the fool. This wasn’t allowed to be. I was dragged out for all to see. We followed our daily trail. My heart was soon to fail. 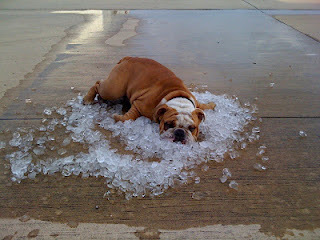 There’s no moving this cooled down hound. This is the Centus prompt graphic. LOL, I loved this. I could really see this whole scene play out. Anyone who has ever had a dog knows that during certain weather, they are almost dragged out the door. Thanks for that visual! Where did you get this photo? Is that your dog? Sounds like the dog has been hanging out here in Missouri – it’s been so hot here, my husband practically dragged me out of the house today. Good job! Really fun take from the dog’s perspective! Dogs always know how to live don’t they! Very cool poem! A very cute poem…love it…nicely done !!! It was fun looking at the world through the eyes of the dog in the prompt photo. ‘Not even shade was cool’. Those words were incredibly cool. And so was your use of this difficult prompt!